First thing's first. 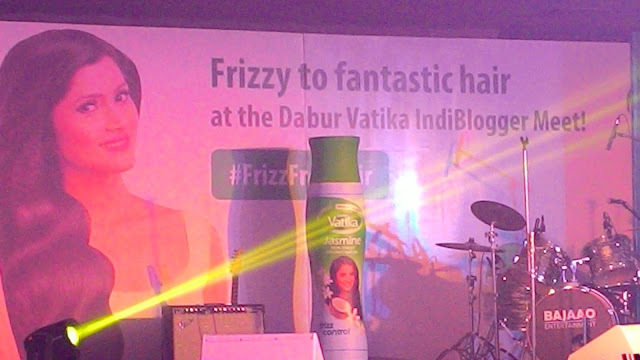 As soon as I spotted #FrizzFreeHair Vatika Women's IndiBlogger Meet at IndiBlogger website, I posted it on forum and dashed to twitter. I tagged as many IB-twitter buddies in my tweets and rushed them to register. Being the journalist, 'Breaking News' is my forte. Wherever and whenever I get any good news, I love to congratulate the winners first hand and share their joy. Almost all of us , Bloggers reached the venue ( B.J. Hall, VileParle ) by auto, not by BMW as Anoop wild-guessed and wished for. 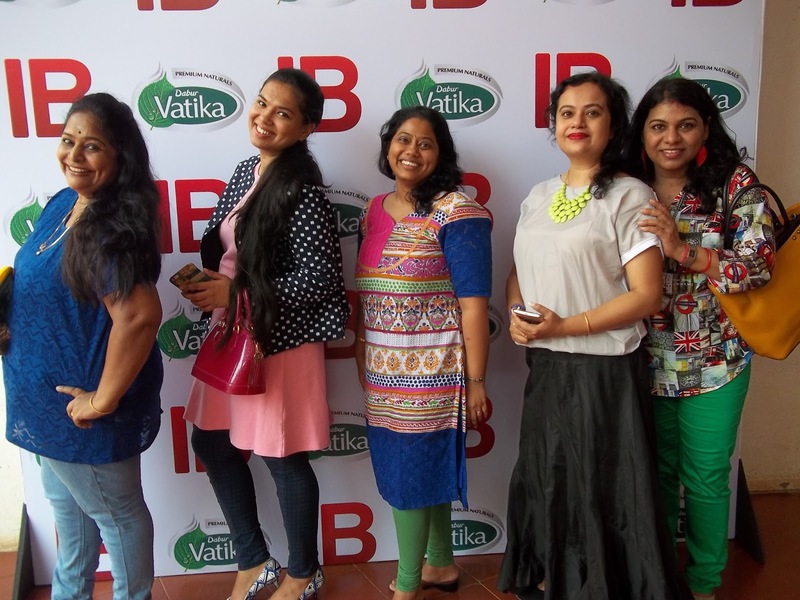 It has become a ritual now to click group photos with banners and blogger-buddies at all the blogger-meets / events. This photo-session gives us an opportunity to break the ice with brand-new IndiBloggers and bonding with branded-bloggers. Did I just say Branded-Blogger ? The IndiBlogger Rock Stars Renie , Anoop , Nihal , Jesuwin and Saurabh set the stage afire and how! What a groovy feast with Pink Floyd - Another Brick in the wall- part 2 - 'We Don't Need No Education' and Lady Gaga's 'Poker Face' ! The above picture does Speak Thousand words and Sings Million Melodies as well... Letting the hair loose had never been so Soulful ... so Surrealistic . The 30 seconds of Fame for bloggers is worth a whole blog-post. 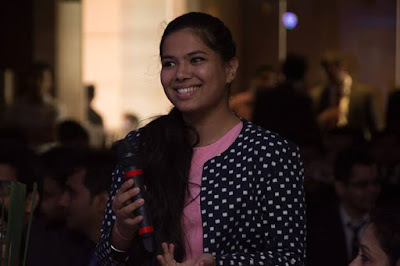 Ever enthusiastic, brilliant blogger, pro-photographer Divyakshi Gupta introducing herself and her blog. This blogger-introduction session at Vatika #FrizzFreeHair meet was totally inspiring for us as well as for freshers. 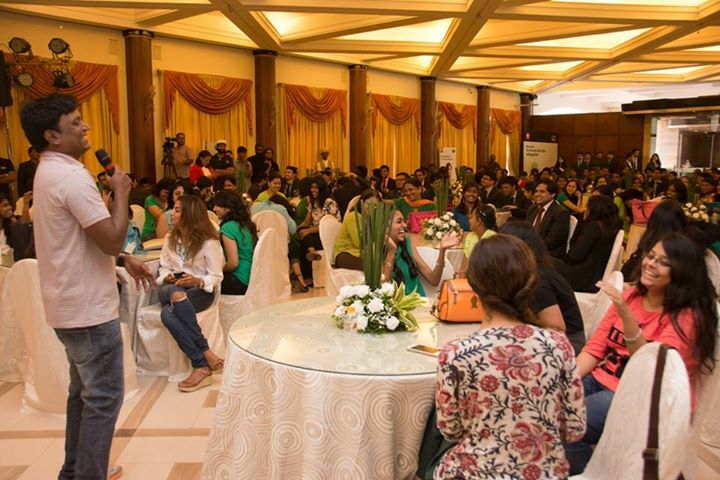 This was the 1st IndiBlogger meet of Geetha Sridhar and Saudamini Naik ( GladRags Mrs. India 2015 ). 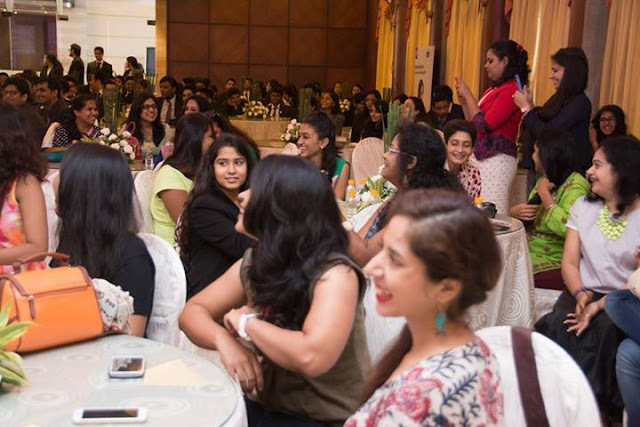 We are so very proud of you and honored to have you both Geetha n Saudamini, among IndiBlogger community. Finally ... Finally , the moment arrived , which we were waiting for ! The launch . 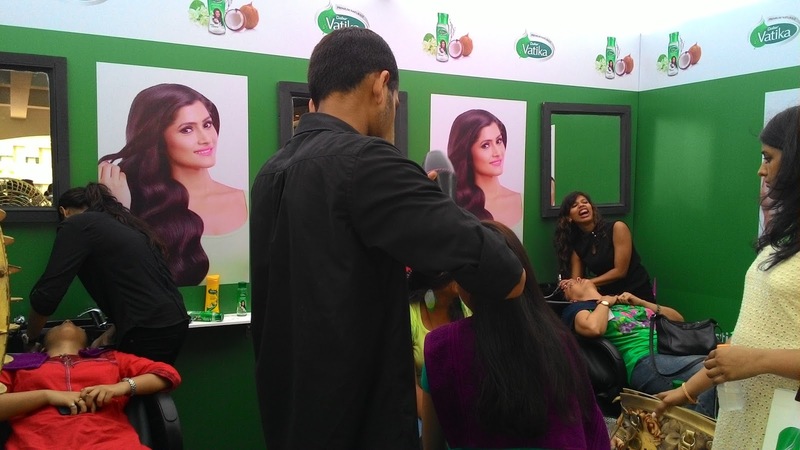 the unveiling of ' Dabur Vatika Jasmine non-sticky coconut oil ' , which guarantees #FrizzFreeHair. 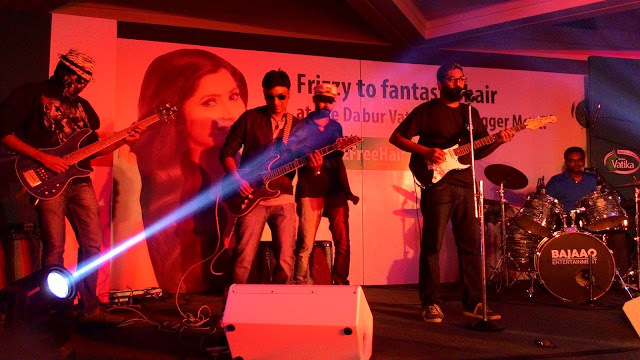 The huge replica of Dabur Jasmine non sticky coconut oil bottle made a spectacular appearance on the stage a la Bollywood star, accompanied by fluorescent light-beams, soft, sweet and enchanting Jasmine fragrance. The Marketing Head of Dabur Vatika spoke about Dabur's rich history in Health care sector. 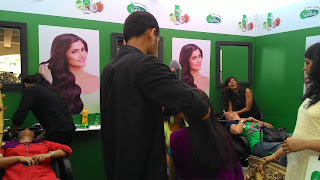 The 1st branded hair oil , Dabur Amla hair oil was launched in the year 1940. We were astonished to know that Dabur is a Rs. 1000 crore international industry. 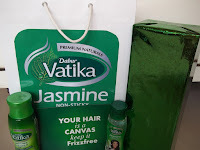 Dabur Vatika Jasmine non-sticky coconut oil is a light, non-greasy hair oil which has mineral, silicon oil base and a little share of coconut oil. This wonderful combination offers easy spread over the hair and our hair doesn't look sticky, oily and dull. It has minerals, vitamins and silicon oils which locks moisture and voila... we have #FrizzFreeHair. Next was a home-remedy contest. The bloggers shared tips and secrets for #FrizzFreeHair. The home-remedies ranged from application, consumption of flax-seeds ( Alsi ), Amla, Fenugreek ( Methi ), Jabakusum , Currypatta, Curd, Eggs etc. to living / enjoying stress-free life. Ekta, Heena , Saudamini ( Gladrags-Mrs. India, in the above picture ) won this contest. 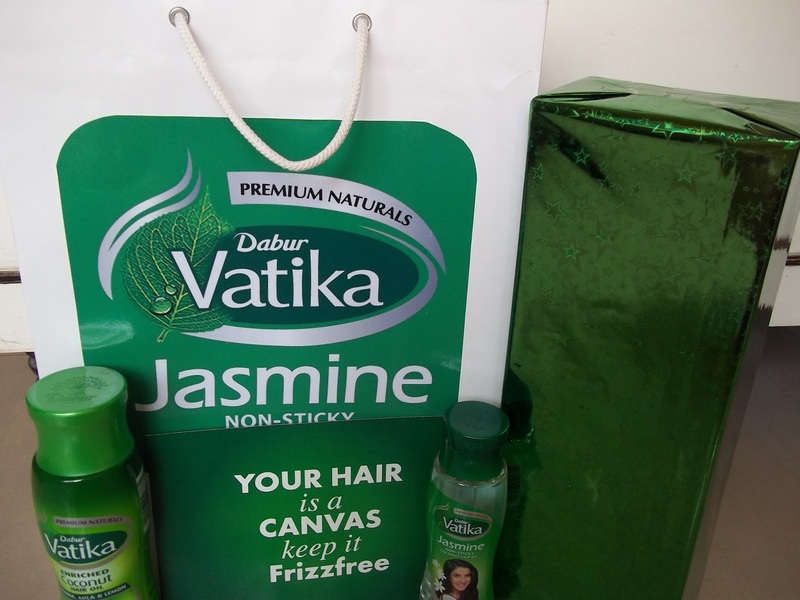 Dabur Vatika Jasmine non-sticky coconut oil is the best to have #FrizzFreeHair and to live #FrizzFree life we need #BFF ( Best Friends Forever ). Anoop , Swati and Jesuwin demonstrated how to play 'Rock-Paper-Scissors'. We played this game with our BFF and as a prize the winner is awarded an opportunity to mess loser's hair full on. I am very touchy, literally about my hair. I guard my hair as if it's Samson's. My nephew says, I must have hidden my Swiss Bank account no. in it. So I played to win as if my life was at stake. Alas ! I lost in the 3rd round. I bargained with the winner , that I will give her my passport size photo as a prize if she messed my hair. Totally alarmed by my blackmailing , that brand-new blogger kept away from me for the rest of the #FrizzFreeHair event. Italian and Indian , yummilicious lunch was served. Most of all, I loved the Ferrero Rocher ice-cream. Free Hair-Styling , champi , shampoo , hair-spa session for #frizzFreeHair was arranged at the specially constructed champi-station. We, the bloggers had arrived at the #FrizzFreeHair meet with messy / frizzy hair due to Mumbai special weather and auto-ride. 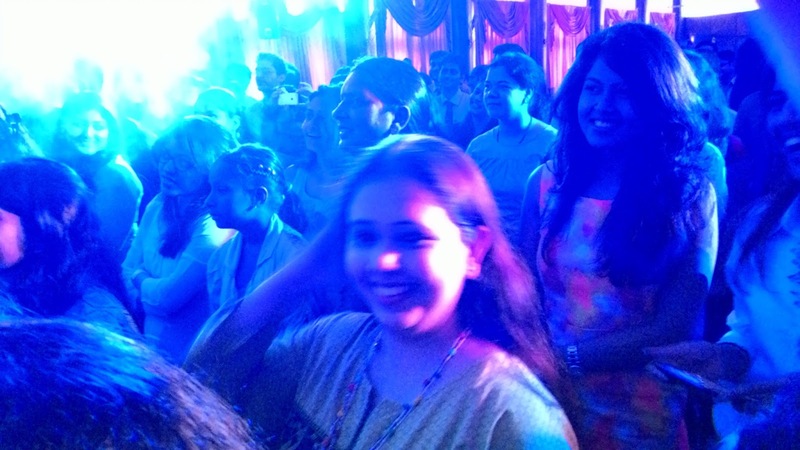 Our hair had further messed up courtesy headbanging with Lady Gaga, Pink Floyd and our very own BFF's mischief . Thanks to Dabur Vatika massage, shampoo, hair-styling i.e. complete hair spa we all gained Made up hair , smelling and feeling like Miss Jasmines, we returned home to brag n blog about Dabur Vatika Jasmine non sticky coconut oil. 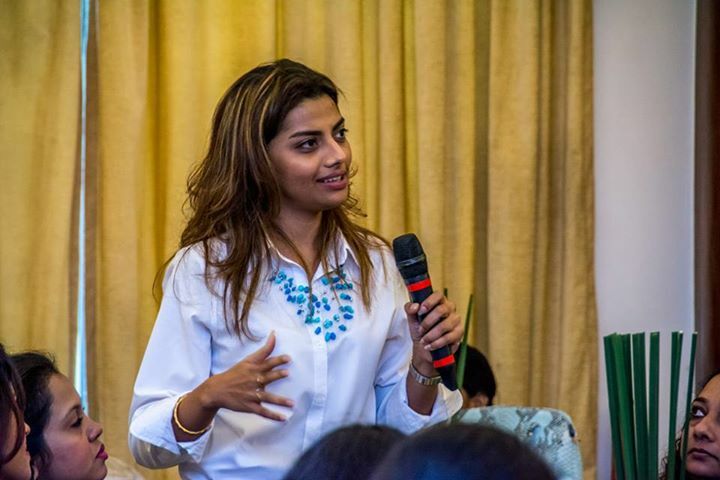 Hi Natasha ,Thanks a lot and welcome to 'Spirit Of Mumbai' . See you soon at #BNLF.